In a Nutshell: An average traveler thinking of an island vacation doesn’t usually picture the Pacific Northwest. 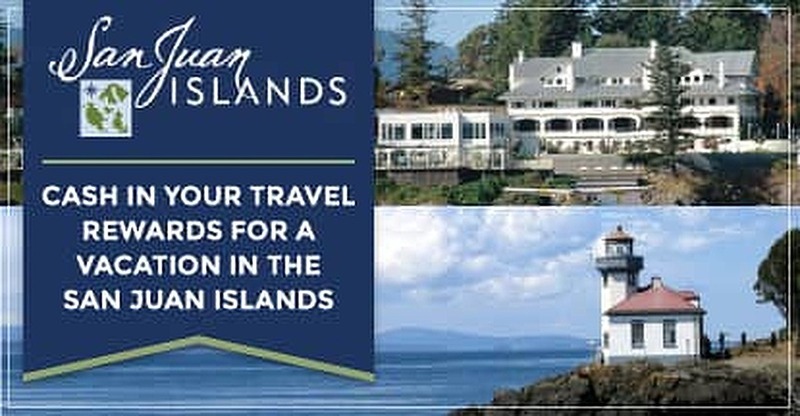 But the San Juan Islands, nestled in the Puget Sound, offer a getaway every bit as rich and relaxing as a Caribbean retreat. Visitors to the islands can get acquainted with the area’s history through various museums and vintage lodging options. Travelers also have ample opportunity to take in historic and modern art and culture. The abundant parks and trails provide opportunities to immerse yourself in nature and encounter local wildlife, including a thriving whale watching scene. If you have credit card travel rewards or points to use, an array of diverse and rewarding experiences are waiting in the San Juan Islands. Photographs and television advertisements have trained most travelers to associate an island vacation with warm breezes, sand, and a gentle surf lapping at the shore — not dipping your feet in the Puget Sound in September. But that’s the charm of the San Juan Islands, which sit off the coast of Washington. The Islands’ popular activities include whale watching, hiking, horseback riding, kayaking, and experiencing a unique culture found only in the Pacific Northwest — all set against the pristine backdrop of coastal wilderness. If you have unused travel rewards sitting in your credit card account, a trip to the idyllic San Juan Islands may be easier (and cheaper) than you think. Most credit card companies have redemption options that will reimburse cardholders for travel expenses such as airfare, car rentals, hotels, tours, and attractions. Points are typically redeemable at a 1¢-per-point conversion rate on eligible purchases, though occasional promotions could make the points even more valuable. Most non-branded travel reward credit cards will reimburse for flights, cruises, or hotel stays at any location and with any brand, while branded credit cards may be more particular with your choice of travel provider. Either option typically provides an online portal to access your account and cash in rewards for either statement credit, cash, or immediate discounts on your travel expenses. Depending on the number of rewards points or miles currently in your account, you could be only a few steps away from a scenic island getaway. With no bridges connecting the islands to the mainland, you must arrive by boat or by air. And as soon as you reach land, the distance from the everyday hustle and bustle is even more apparent. Of course, the islands aren’t completely isolated. Residents and visitors often use ferries to move between islands and experience the unique vibe each offers. The archipelago contains a few hundred islands, but Marrett said several are only rocks and reefs in the water. Of the nearly 200 named islands, only Lopez, Orcas, Shaw, and San Juan Island are served by the ferry. 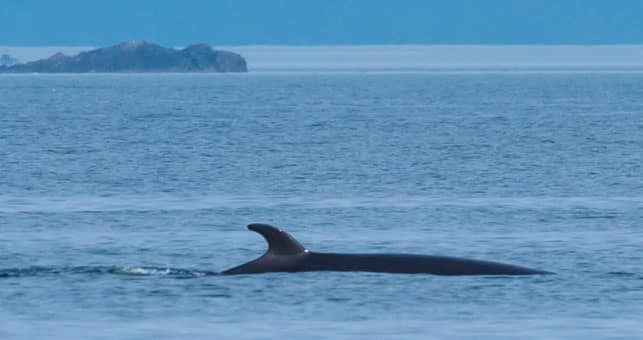 Whale Watching often results in glimpses of marine life like this Minke Whale in the waters around Orcas Island. Much of the San Juan Islands’ charm comes from its natural beauty, historic sites, and accommodations. Take, for example, Friday Harbor, the county seat and busiest site in the islands with a population of 2,800 full-time residents. As soon as visitors step off the ferry onto the harbor, they encounter vintage wood-frame buildings that date back to the territorial era. Many historic accommodations are available for those who want to immerse themselves in the island life of yesteryear. Among the most popular is Tucker House, located in Friday Harbor. Dating back to 1898, Tucker House is a collection of Victorian buildings and cottages situated near the harbor, which makes it ideal lodging for anyone interested in whale watching, island hopping, and other aquatic adventures. Roche Harbor Resort, built in 1886, features the historic Hotel de Haro, Washington’s oldest operating hotel. Outlook Inn, located on Orcas Island, has its own colorful history. The building originally served the island as a jail, general store, post office, and dancehall. Rosario Resort and Spa, also on Orcas Island, features 30 acres of primarily waterfront rooms centered around the Moran Mansion — built between 1906 and 1909 by Robert Moran, a Seattle shipbuilder and its former mayor. “The mansion itself has a restaurant and a wonderful spa and historic spa pool,” said Marrett. “There’s an Aeolian pipe organ, and in the summer — every day except for Sunday — they do a free historic concert. Visitors can experience and learn about island culture through vintage lodging and by visiting the islands’ many educational and cultural institutions. These offer an in-depth look at the islands’ history, heritage, and arts. The San Juan Historical Society and Museum rests in a historic farming complex that includes the original county jailhouse and a pioneer cabin. Visitors can learn more about the island’s past through the society’s collection of artifacts, documents, and photographs. If your tastes lean more toward art than history, the San Juan Islands have you covered there, too. The Arctic Raven Gallery in Friday Harbor features works by natives of the Northwest Coast and Arctic, including masks, wood carvings, prints, and more. The WaterWorks Gallery on San Juan Island showcases modern art by local artists and others from around the Pacific Northwest. San Juan Island also offers its Artists’ Studio Tour for visitors who are looking for a more intimate experience. This program, available each spring, is free and offers a look inside more than a dozen studios operated by painters, potters, jewelers, sculptors, and various other craftspeople and fine artists. If you’re feeling more social, Lopez Islands’ Center for Community and the Arts hosts concerts and dances, as well as theatrical and art shows. The San Juan Community Theatre also features local productions as well as touring theater, music, and dance performances. And if you want to experience art in the great outdoors, try the San Juan Islands Sculpture Park. This 20-acre facility features over 150 sculptures on a rotating schedule. Art academics from local colleges and universities curated each piece on display. Outdoor adventurers are abundant on the San Juan Islands, with plenty of opportunities to enjoy the scenic beauty of the historic area. To cover more territory, cycling guides are available for each of the major islands. These tours include maps and routes curated to include various sites of interest and local amenities so cyclists can take in the islands’ ambiance at their own pace. The islands also offer a multitude of parks for those who want to immerse themselves in nature. Among these is the famed Moran State Park on Orcas Island. The park covers more than 5,000 acres and is home to 151 campsites and 38 miles of hiking trails. Visitors can also go horseback riding or get their feet wet boating or swimming in Cascade Lake. 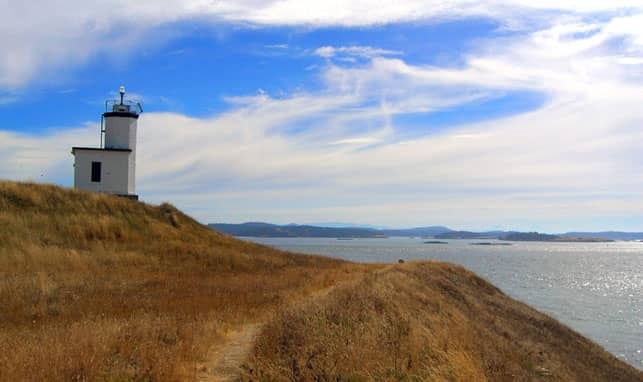 Cattle Point Lighthouse, in the San Juan Islands, is a popular tourist destination. Moran Park is also home to Mount Constitution, the highest point in the San Juan Islands. At its peak sits a replica of a 12th-century Russian watchtower constructed by the Civilian Conservation Corps in 1938. From there, hikers can enjoy a panoramic view of the Cascade Mountains, the islands, and the Canadian and US mainland. On San Juan Island, visitors can explore Lime Kiln Point State Park, also called Whale Watch Park. For visitors who get tired of hoofing it around the island, there are ample opportunities to get out on the water in boats, canoes, and kayaks and possibly spot seals, sea lions, orcas, and humpback whales in the water as well as bald eagles in the air. Marrett suggests first-time visitors come to the islands in September because the islands aren’t as busy and the chances of seeing whales are higher. “The weather’s great in July and August, but it’s when a lot of families take their vacations, so it’s busy,” she said. “But busy is a relative term. Compared to other places, it’s not that busy.